The hotel's palm tree-lined swimming pool. 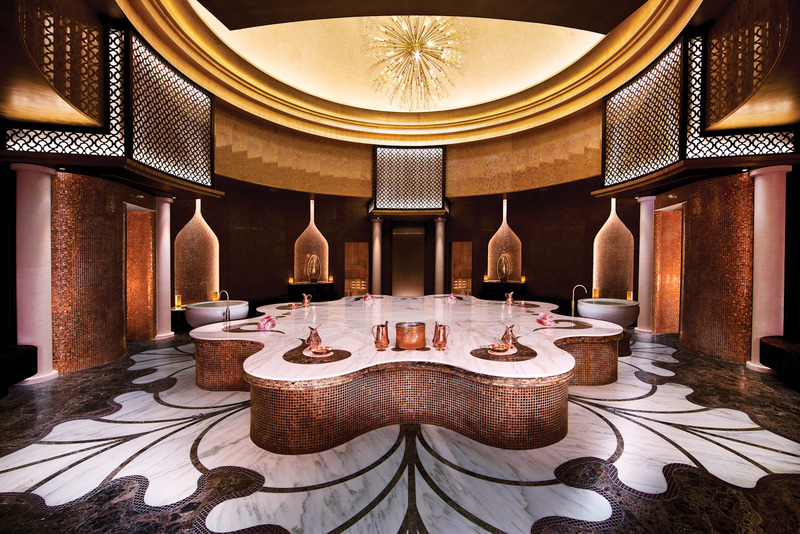 Head to the hotel's own hammam for a Turkish massage. Inside a Kasara Executive Balcony Room. 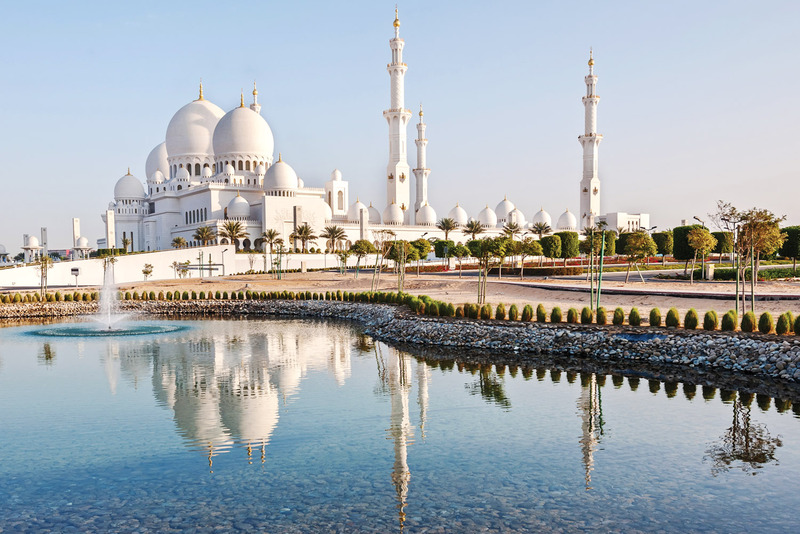 Abu Dhabi's Sheikh Zayed Mosque. Six airports in half as many weeks, navigating almost 30,000 kilometres…our recent holiday in Europe was a thrill, but jam-packed and, admittedly, a rather lengthy trip for one weary set of parents with a 10-month-old baby in tow. To break up the journey home – and to keep our sanity intact – we decided a stopover in Abu Dhabi was a necessity. At the Abu Dhabi International Airport arrivals gate, we find the Anantara Eastern Mangroves Hotel & Spa chauffeur waiting, a hotel signboard raised in his hands. For privacy reasons, the Anantara doesn’t advertise guests’ names at airport pick-up – the gesture is a prelude to the discreet and discerning service that awaits. A smooth 20-minute ride delivers us to the hotel where we are whisked straight into the lobby, an elegant space of marble and cream fringed by lattice walls, decked with armchairs and sofas redolent of precious metal, and a glistening chandelier centrepiece dripping from the ceiling. The crisp, cool interiors are a refreshing contrast to the dry, soporific heat outside. In line with traditional Emirate hospitality, we are offered a tray of dates and tea; and having pre-booked one of the Executive club rooms we are escorted to the club lounge reception on the fifth floor for a more personalised check-in service. Our Kasara Executive Balcony Room is spacious, modern and stylish, with traditional Arabian touches and a warm, earthy colour palette that echoes its desert location. Happily, our pre-arrival request for both a non-smoking room and baby cot has been obliged – the latter a full-sized crib in a solid wood frame (no flimsy travel cots here) that is easily accommodated in the vast 57-square-metre living area. Equally enormous is the bathroom, which has a rain shower as well as a deep bath tub – perfect for reviving and relaxing tired bods respectively – and the Anantara’s signature range of toiletries, with squares of soap delicately perfumed with cardamom and clove. Other noteworthy features include complimentary wi-fi, a Nespresso machine for impromptu caffeine hits (coffee is a new parent’s best friend), and a dreamy king-sized bed that has us drifting into slumber within seconds. Access to the aforementioned club lounge is a welcome benefit: private concierge, laundry service, pre-dinner cocktails paired with substantial canapés, and a hearty breakfast among its generous inclusions. With a prime waterfront position overlooking verdant wetlands of mangroves and the city skyline in the distance, the lounge offers spectacular sunset views. With aperitif in hand come the evening, we marvel and watch as a giant fireball unfurls scarlet streaks across the sky, setting ablaze a silhouette of glinting skyscrapers. Another highlight is the hotel pool – an oversized cobalt grid fringed by sentinel-like palm trees in a tranquil riverside spot. With water the temperature of a calming warm bath and attentive staff on hand with iced drinks, cold towels and mini spritzers of lavender mist to keep the sweltering desert heat at bay, this is the perfect place to laze away languid afternoons. When the scorching sun gets too much, I escape to the spa. The Anantara brand is renowned for its superior spas and the one here is no different, offering a multitude of therapies to melt aches and soothe jet-lagged muscles. I indulge in a Traditional Turkish Hammam treatment. Lying on a flower-shaped marble slab in the open hammam area, gazing heavenward at glossy mosaic tiles and a soaring domed skylight dotted with oversized dandelion-like sculptures, while being gently cleansed with a foam massage is an ethereal experience. Refined yet relaxed, Anantara Eastern Mangroves has a level of service that is impeccable enough to impress business travellers, intimate enough for romantic getaways, and fun and child-friendly enough to appeal to families. For us, the hotel is a stopover sanctuary. We ensconce ourselves for two nights where we have want for nothing, and neither need nor desire to leave the place during our entire stay. But when the time does come to depart, we are ready to face the dreaded long-haul flight home, well-rested with baby, and sanity, in tow. 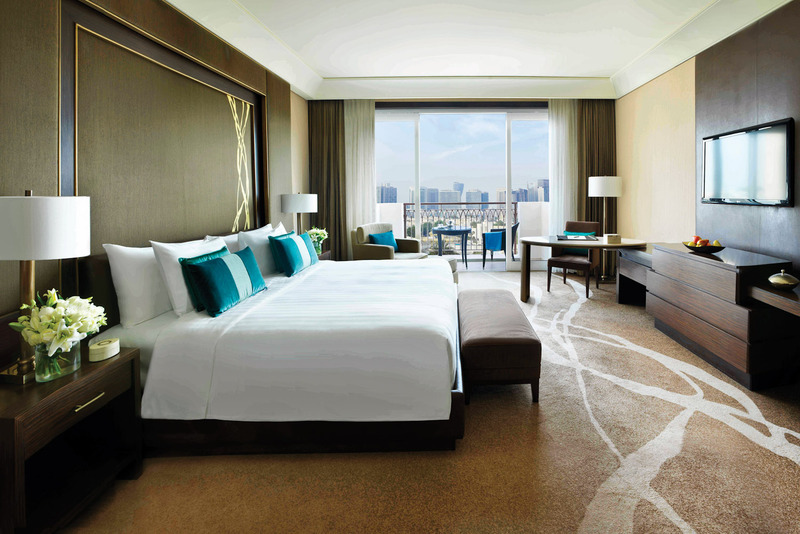 Mere minutes away from Abu Dhabi’s airport, Anantara Eastern Mangroves is ideally located as a luxurious transit accommodation option for travellers midway between Europe and the Antipodes. Secluded riverfront setting, yet situated close to the lively heart of the city and easily accessible to many tourist attractions. The décor marries traditional Middle Eastern architecture and contemporary design, providing a soothingly sleek ambience that is also opulent without ever being ostentatious. Travelling with a baby (and the excess baggage this entails!) meant that we were appreciative of the ample size of our Kasara room, and the club lounge access with its multitude of perks. With five dining options ranging from casual pizzas poolside and authentic Thai dinners to wine and cheese in the glamorous bar, we were spoilt for choice without having to venture off site. We paid $382 for two nights’ accommodation – a bargain given the thoughtful facilities and chance to recharge in luxury before the long-haul leg home. 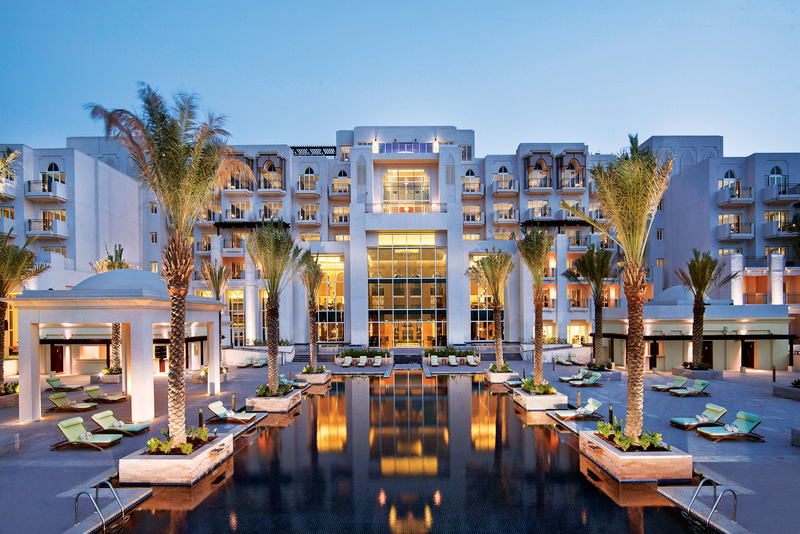 Is this Abu Dhabi's most indulgent hotel?